Annual Quilt /Hawks Aloft Inc. The Hawks Aloft quilt raffle is an annual tradition. Each year, Gail Garber–nationally known art quilter, author, lecturer and teacher–creates an original design for the Hawks Aloft quilt. Once the design is completed, it is cut and stitched by an all volunteer team at the annual winter retreat. 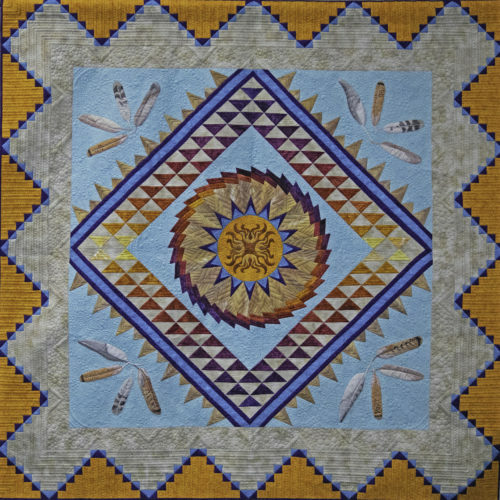 The quilt is unveiled each year at the Monte Vista Crane Festival in March. 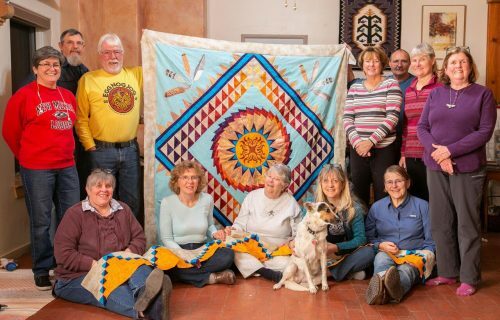 The Hawks Aloft community works together and produces both a stunning heirloom quilt and a successful fundraiser for the organization. The proceeds from the raffle benefit the Hawks Aloft educational birds by helping to defray food costs. The winning raffle ticket will be drawn at the annual Hawks Aloft Holiday Party in December, 2019.